To download applications to your Acer Liquid M330, you will need an Android Market / Play Store account. Click Next for instructions on setting up your Acer Liquid M330. Choose an option, in this case Microsoft account. 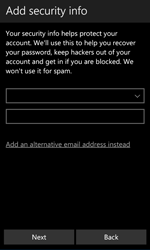 If you have a Microsoft account, choose Email or phone, enter your login information and follow the on-screen instructions. If you do not have a Microsoft account, choose Create one. and go to the next step. Choose Surname and enter your last name. If you have an e-mail account, choose someone@example.com, enter your e-mail address and skip the next step. If you do not have an e-mail account, choose Get a new email address and go to the next step. Choose New email and enter a username. The Acer Liquid M330 is now configured for use of the Store.